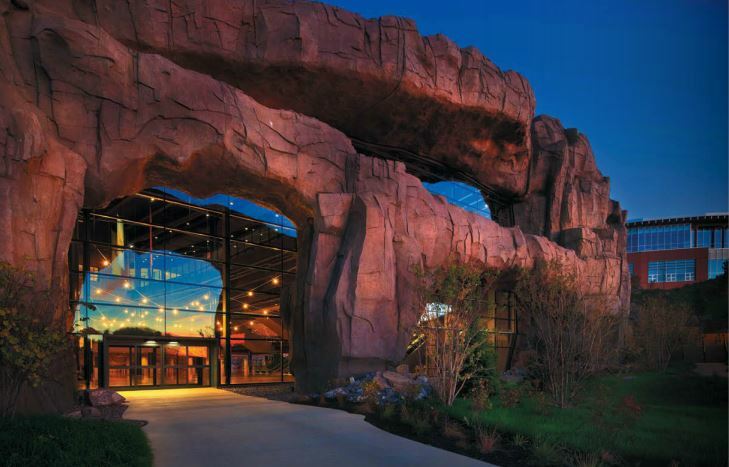 Epic Systems’ new Deep Space auditorium is spectacular to see and experience, but its constructors know it was epic collaboration and innovation that made it an Alliant Build America Grand Award winner — from the bottom up. He is speaking of the Epic Deep Space auditorium, the functional, beautiful engineering marvel that walked away as the 2014 Alliant Build America Grand Award winner in a year with a record number of submissions. To say that the facility, with its stunning, cave-like façade, blends with the landscape is almost too conservative; rolling acres of green roofing, from nearly every angle, create a visual fusion of earth and architecture — one that was delivered on budget and even more miraculously: ahead of schedule. The collaborative tack — between the construction pros at JP Cullen, the structural engineering giants at Thornton Tomasetti, architectural artisans at Cuningham, a host of major subs and the owners themselves — was the factor that pulled the great ideas together, taking the project from a literal hole in the ground to two AGC Alliant Build nods, including top honors in the winners’ circle. Indeed, the project doubled from inception to final plans. Early on-paper plans called for 405,000 square feet. That became 832,000. Twelve escalators became 42. A 45-foot-high concrete retaining wall became a 65-foot soil-nailed wall. And these are just a few examples of its exponential growth — all in the face of an immoveable delivery date. They had 28 months to occupancy, 40 overall. Epic needed the space to be fully functional in time for its annual Users Group Meeting; there wasn’t a facility in the state that could handle the roughly 10,000 expected attendees. So how do you put a state-of-the-art, 11,400-seat auditorium, not to mention conference rooms, training rooms and offices — collectively named “Deep Space” — 73 feet down into the unforgiving stone of Wisconsin? With “big bangs,” of course — a minimum of two daily. “At such an aggressive pace, the work was choreographed so that activities were concurrent,” says JP Cullen division manager Dan Swanson, an executive project manager on this build. Blasting and excavation for 495,000 cubic yards of rock plus piles and concrete work were performed amid a host of other on-site work. Or incidents. The 40-month undertaking utilized 293 tons of explosives on 688 blasts. Neither these nor any other elements of the project spiked safety-related incidents, which clocked in below Wisconsin averages. Challenging, yes. But a source of great enjoyment for his team. Thornton Tomasetti, says Swanson, helped the Cullen team better understand their options, which ultimately led to the strand jacking of the auditorium’s roof system and a massive uptick in the efficiency of the process. “We were only using a small part of the power of the 20 planned strand jacks,” Swanson explains. Their partners at TT explained they could actually lift much, much more. “And then the floodgates of creativity opened up!” The team developed a plan to pack every part and piece of the building they could into one massive lift. Instead, the lowest elements went in first — and once through, they lifted more than 8 million pounds up into the air. Micromanagement on a project of this scope and schedule would have been a death knell. And eight separate arms — each with its own management team, subprojects working in conjunction with an overall master schedule. Much of the project was prefabricated off-site, then assembled and lowered into the building before the big roof lift. “You can’t put 42 escalators in in a week,” Schumacher notes. The prefab method was an epic time-saver, shortening the installation time in the field from 24 weeks down to nine. Fifteen weeks earlier to ensure that the roof made it up, 15 weeks earlier so the sides of the building could be installed and so forth. From procurement challenges (much of the necessary material had to come in from Belgium in a very short time) to the extensive simulation necessary to determine the number of escalators necessary to safely and efficiently move guests out from the auditorium in 20 minutes or less, each hurdle was soared over, say all three, due to the collaborative nature of the project. Technology played no small role. “Shop drawing in the cloud was new to everyone,” says Schumacher. “Were there a few small hiccups? Yes.” Even so, he jokes that without their tech-based leap of faith they’d never have gotten it done on time. “That’s facetious,” he says. “I don’t think it is,” Swanson counters with good humor, saying it could easily have taken a year longer. He committed to Schumacher in February 2014 that the project would take home the Alliant Build Grand, though the project wouldn’t close up until August. Other people weren’t so quick to voice confidence aloud. This wouldn’t be its first submission; Cullen had been the bridesmaid before — but never the bride. The scale, the speed, the design — all these factors, says Stadler, make Epic’s Deep Space one of those special, career-milestone projects. His team saw it very early on.